This document was created to provide instruction for the WebView module for online web production tracking for Control. The status (and station) of current orders. Historic orders, including the line item details. Approve, Reject, or Request Changes in an Estimate. Changes or requests made by the customer are NOT automatically propagated into the system. For security and approval reasons, all changes requests are sent via email to the store email address. Processing, approval, and entry of the information is left to the email recipient. Each of these areas is detailed in the following sections. This is the main screen you will see immediately after you log into WebView. The basic function of this screen is to show all orders and estimates for the company. You can also print this page by clicking 'Print This Page' at the top right corner. By clicking on 'Work in Progress', this screen will appear. This screen is used to view orders and estimates in WIP. The basic function of this screen is to find and view all orders in the system. All orders will be shown on the screen, no matter what station it is in. The basic function of this screen is to find and view all completed orders in the system. ONLY completed orders will show. The basic function of this screen is to find and view all orders in the system. The basic function of this screen is to find and view all line items in the system. All Estimate Line Items will appear at the top of the screen under the heading “All Estimate Line Items”. All Order Line Items will appear at the bottom of the screen under the heading “All Order Line Items”. You can also approve proofs from this screen by checking the check box next to the line item that you would like to approve. The basic function of this screen is to show all the Orders and Estimates that have proofs required. Only Estimates and Orders that require proofs will be shown. The basic function of this screen is to show all the statements in the system. The screen is sorted by order number. All payments in the last 45 days will be shown at the bottom of the screen along with the total outstanding balance. In order for these requests to work properly, you will need to setup your email settings inside of Control to use the “Internal” options, and have all the fields filled out. If you do not, your customer will receive an error when they try to click the 'Send Email' button. 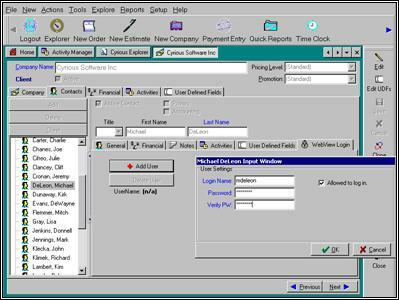 The basic function of this screen is to allow the user to request a quote. By clicking on 'Request a Quote' the user will be brought to another screen that looks like the screen shot below. By filling in all the required fields, the user will be able to request a quote from the company. Please Describe Sign(s): The user must describe the sign they would like to have designed. Try and be as specific as possible, seeing that the more detailed the description, the more accurate your price will be. Other Notes: The user is able to add any extra notes in this box, such as questions, concerns, etc. When would you like to be contacted? : Allows the user to select a contact time frame, either ASAP, This Week, or This Month. Please contact me by: Allows the user to specify how to contact him, either by email, phone, or fax. The basic function of this screen is to allow the user to request a follow up by the company. By clicking on 'Request a Follow up' the user will be brought to another screen that looks like the screen shot below. By filling in all the required fields, the user will be able to request a follow up from the company. Notes: The user is able to add any notes in this box, such as changes, questions, concerns, etc. The basic function of this screen is to allow the user to change their password. In order to change a password, you must know the old password and come up with a new one. Old Password: The user must enter their old password in this field. New Password: The user must enter their new password in this field. Confirm Password: The user must re-type their new password in this field. The basic function of this screen is to display all of the company's info. The company phone numbers and address are in blue, which means you can request to edit them. If you click on the phone number, you will be directed to a 'request to edit' screen where you can edit the phone number. The same thing will happen if you click on the address or fax number. The basic function of this screen is to show the contact information for the company. This screen will include the contact information for the shop and the user's salesperson's information. WebView will require a web server to operate. This may be the same computer as the SSLIP server, or another computer that has read/write access to the SSLIP server. Understanding how WebView interacts with Control will help your IT professional plan your WebView deployment. WebView is deployed on Microsoft IIS. The server running WebView will be referred to as the Web Server. WebView communicates with the Control SSLIP by exchanging messages. The messages are written into files, which are read by the other program. Because of this requirement, the two programs (WebView and the SSLIP) must be able to access a common shared folder. WebView uses a configuration file (webview.inc) to tell it the path to the SSLIP server. WebView retrieves information from the Microsoft SQL Server or MSDE database. WebView must be able to communicate with the database server (which is usually the same computer running the SSLIP). 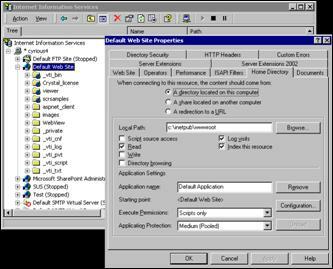 When WebView is started, it obtains the database connection information from the SSLIP. In order to display high-resolution artwork for proof approvals; WebView requires access to the computer and network containing the artwork files. This feature is not yet available, but should be planned for in any WebView deployment. For the above reasons, it is strongly recommended that the Web Server run on the same network as the SSLIP Server. The web server needs to be able to access the Control Server. The default path, which may be changed, is \\servername\Cyrious$\SSLIP\WebView, where servername is the name of the Control Server. The Web Server must have permission to find, open, read, create, and delete a file inside that folder. If the default location and share is not used, then a configuration file (webview.inc) must include “SSLIPFolder=xxxxx” to identify the path to the shared folder on the SSLIP server, where xxxx is of the format \\servername\sharename\path. You must add the WebView application as a website under IIS. You should install the WebView application under the root IIS folder. Microsoft SQL Server or MSDE must be installed on the Cyrious Server. This is a normal part of the Cyrious Control Installation. You can check by going to Start | Settings | Control Panel | Administrative Tools | Services, and make sure these services are Showing, Started, and are set to Automatic. If Index.asp is not in the list of Default Documents, click the Add button and type in Index.asp as the Document Name. Click OK and then click OK to close the window and save. Make sure you are logged in to the Web Server as a user that has administrative powers. Have your web designer create a link in your company website that links to http://www.myweb.com/WebView/Index.asp, where myweb.com is your URL. This will allow your customers to login from your current website. Update the webview.inc configuration file located in the WebView folder. Edit the line “SSLIPFolder=xxxxx” to identify the path to the shared folder on the SSLIP server, where xxxx is of the format \\servername\sharename\path. Make sure that everyone has permissions to write and modify on that folder. Make sure in Antivirus Setup that Script Blocking has been disabled or WebView will not work. In IIS, make sure the IP for the website is set to (All or Unassigned) unless already set to something else. In the SSLIP, set the file path to the shared folder and set which database is being used. Open the SSLIP and go to the Tools menu. Select WebView Setup and click the Edit button.